An All-Star Concert Celebrating Bob Marley’s Iconic Album Exodus featuring Ziggy Marley, Stephen Marley, Legendary Producer Don Was, And Renowned Musicians, Tom Morello, Gary Clark Jr., Jim James, Citizen Cope, Aloe Blacc, Cyril Neville,Terence Higgins, and more to be added. 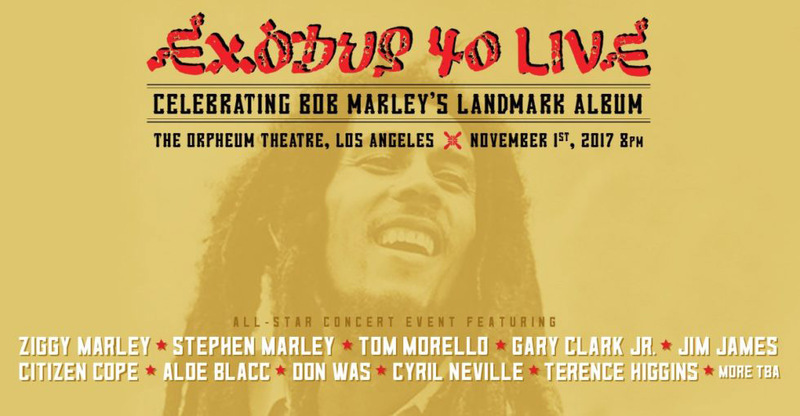 Blackbird Presents is proud to announce Exodus 40 Live, an all-star concert celebration event set to take place Wednesday, November 1, 2017 at the Orpheum Theatre in Los Angeles. Celebrating the 40th anniversary of one of the most iconic and inspirational albums ever recorded, the evening will feature performances by an extraordinary lineup of musicians. Music director Don Was will be joined by Ziggy Marley, Stephen Marley, Tom Morello, Gary Clark Jr., Jim James, Citizen Cope, Aloe Blacc, Cyril Neville, and Terence Higgins, with additional artists to be announced in the coming weeks. “Bob Marley’s songs, and the songs of Exodus, are more important than ever. I can’t think of any better way to celebrate the 40th anniversary of this iconic album than alongside his family and these incredible musicians,” says Keith Wortman, Founder and CEO of Blackbird Presents. In early 1977, Marley flew to London after escalating political violence in Jamaica led to an assassination attempt on his life. During his sojourn there, Marley and the Wailers recorded the heartfelt musical masterpiece, Exodus. From the soulful skanking in Jamming to the funky gravitas of Exodus to the sweet melody of One Love / People Get Ready, the songs went on to become a seminal album to renowned musicians and fans everywhere. In 1999, Time magazine declared Bob Marley’s Exodus the best album of the 20th century, and BBC designated One Love as the song of the century. Tickets go on sale Friday, September 29, 2017. Fans can also purchase tickets at the Orpheum Theatre box office.